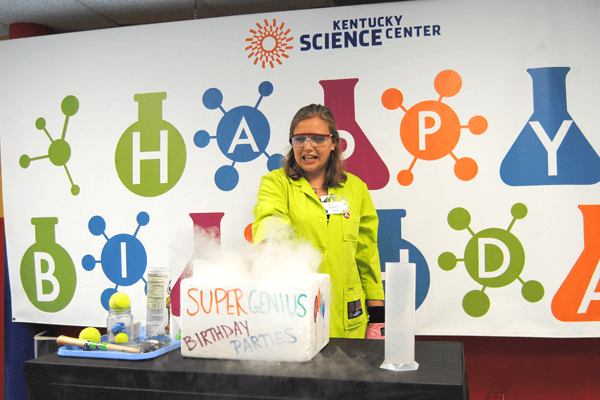 At Kentucky Science Center, we promise a birthday party experience like no other. Your little scientist can choose from a variety of themes, such as space exploration, messy science, dinosaurs, and even pirates; they’re certain to spend their birthday celebrating with friends and family, and doing things that interest and inspire them. Birthday parties include liquid nitrogen ice cream, themed activities, a Science Center t-shirt, and more. You get to be a paleontologist for the day when your birthday party is dino-themed! Learn about different dinosaurs, when they lived, and just how BIG they got. Make your very own dinosaur egg to take home! Yargh matey, there be science in them waters! Get ready to set sail on the high seas at this party. Learn what makes a boat float, shoot film canister cannons, and even go on a treasure hunt! The name’s Genius. Super Genius. This party has a secret mission, and you get to solve the crime! Use science to decipher a secret code, test finger prints and blood types, and catch the culprit! You’ve gotten your “letter,” now it’s time to head to the wizarding world! Go to Potions class and mix color-changing concoctions. Create your own troll bogies, but make sure not to get your wand stuck! Give your little Curie their first lab experience, and get messy with our favorite non-Newtonian fluid! Then, grab your goggles and learn what substance to add to water to create an indoor rocket. There’s a big world inside of bubbles! Learn all about the science that makes these phenomena possible. Explore the shapes and sizes bubbles can take, and then create your own bubble art. "Houston, we have a party. Stand by for cake and ice cream." Explore the dazzling world of outer space and the distinct planets that make up our solar system. Learn the chemical reactions that allow rockets to fly, and then launch your very own! There's more to butterflies than the beautiful designs they display as they flutter by. Take flight on the wings of a butterfly in this party: learn about camouflage, mimicry, and more! Don’t see the theme your little scientist wants most? Let us make their birthday dreams come true: we’ll design a birthday party just for them!